Wisetek services reduce the risk, cost and complexity associated with securely managing IT assets and consumer electronics throughout their entire lifecycle in compliance with environmental and data security regulations. Wisetek provides world-class services to achieve a maximum financial return from advanced reuse, remanufacturing, remarketing and recycling of retired IT equipment. Their unique processes enable clients to be legally and ethically responsible for their IT asset disposal and data destruction services, giving them environmental responsibility for their redundant IT equipment. 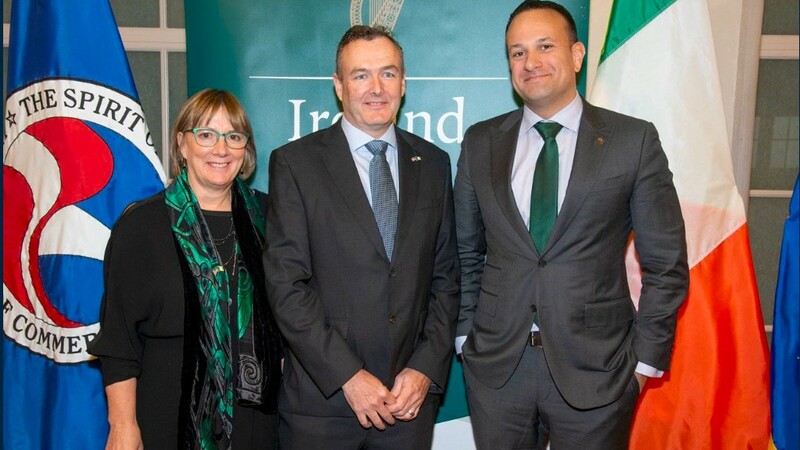 Welcoming this announcement, Irish Prime Minister, An Taoiseach, Leo Varadkar said: "I would like to warmly congratulate Wisetek on its continued success and expansion in the US. As we all know data is becoming an increasingly valuable and important commodity. Wisetek is using innovative technologies to allow its clients to carry out their work in an ethical, efficient and secure manner. I have no doubt that demand for their services will only increase in the years ahead." Over the past 12 months, Wisetek has expanded from a single US facility, to a footprint now with four, full-service facilities in Austin Texas, Milford Massachusetts, Sacramento California, and Washington DC. The company's newest facility in Winchester Virginia, opened this month and there are plans to bring a complete staff of 50 aboard by the end of April 2019. Wisetek is also on track to open two more US facilities this year, including locations in Colorado and a second location in California. "The US market is very interested in economic and ethical IT asset disposal and reuse. Much of this is being driven by data centers restructuring toward co-location facilities, and with corporate consolidation," said Christopher Scott, President, Wisetek. "We're currently processing more than 20,000 devices daily within our US facilities, and our new locations will significantly increase this number". Globally, 14.5 million items have been recorded and processed through Wisetek facilities to date, with over $1 Billion in components recovered for client and internal use. Approximately 10 million disk drives alone have been certified erased or destroyed. The new US locations join the Wisetek set of facilities in Europe, Asia, and the Middle East. In November 2017, the company merged with Washington D.C. based CDI/DataKillers. The partnership has produced the largest fleet of mobile data destruction vehicles across the country and now provides the customers of both organizations with total national and International coverage for on-site data destruction, IT removal, reuse and recycling services. "Our US headcount was a dozen employees in 2017, and now we're looking at exceeding 200 employees by the end of 2019," said Scott. "As we continue to expand, our plan is to establish additional, larger facilities, particularly within states where we currently do not have a presence." By establishing state-of-the-art facilities that process materials on a Lean Six Sigma basis, Wisetek is a comprehensive solutions provider, utilizing self-developed, proprietary software to track and manage customer assets with extreme efficiency. "Irish companies are known the world over for innovation, flexibility and the competitive advantage," said Julie Sinnamon, CEO, Enterprise Ireland. "Wisetek typifies the growing success of Irish companies internationally and particularly in the USA, where almost 800 Irish-owned companies operate across all 50 states are employing over 100,000 people."